This page will be updated as new opportunities are shared with the SCHS Counseling Department. CORO Youth Fellowship - An immersive, experiential, cohort-based summer program (June 24 - August 23nd) that engages high school participants in leadership skill development and understanding how local systems work. SDSU Girls STEM Camp - (for entering 9th and 10th graders) Sponsored by the San Diego State College of Engineering this camp will include hands-on STEM activities including: coding robots, creating circut artwork, and exploring much more. The deadline to sign up is May 17th. 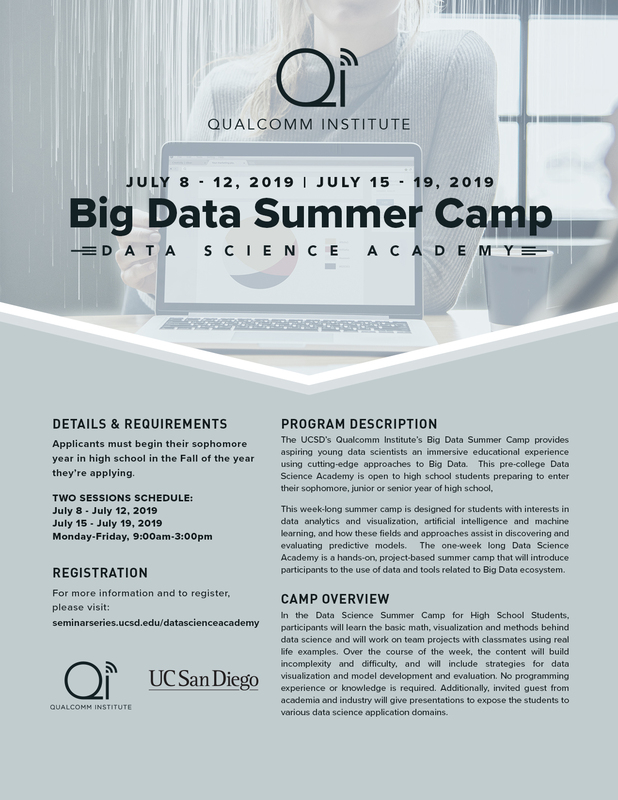 Big Data Summer Camp - (for entering 10th graders only) Offered through UCSD's Qualcomm Institute, this week-long camp provides aspiring young data scientists with an opportunity to learn the basic math, visualization and methods behind data science. Refer to the camp flyer for more information, priority deadline to apply is May 31st. Boston University Summer Journalism Institute - The New England Center for Investigative Reporting presents a once-in-a-lifetime experience for high school students interested in journalism, communications, or writing. Applications due by June 1st. Waterworks Aquatics in Carlsbad is actively hiring high school and college students as part-time swim teachers. Visit Waterworks for more information. De Leon Dynamics is looking for fun and energetic instructors and front desk associates to join their team! They are looking for instructors for Parkour and aerial classes as well as for their upcoming summer camps. Refer to the attached flyer for more information. The Wave Waterpark is currently hiring for their summer season. Applications can be found online and must be submitted to the Wave Office Mon. - Thurs. through 4 p.m. The City of Carlsbad is hiring for the summer. Many part time jobs are available such as Recreation Leader, Lifeguard, etc. Refer to the online application here. The City of Carlsbad Cultural Arts is hiring for the following part time positions; TGIF Crew, and Summer Arts Staff. Refer to the 2019 Summer Arts Opportunities flyer for more information.